In this post, we will learn how to perform feature-based image alignment using OpenCV. We will share code in both C++ and Python. 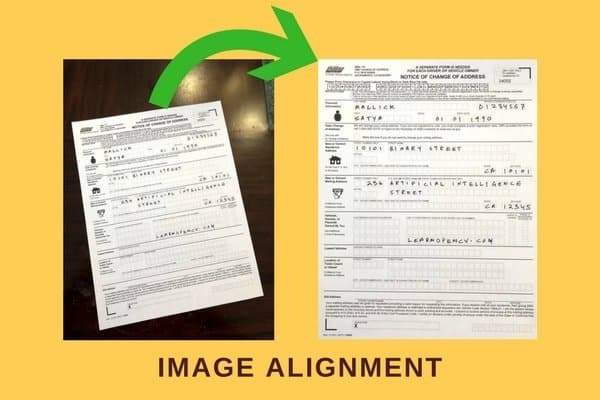 We will demonstrate the steps by way of an example in which we will align a photo of a form taken using a mobile phone to a template of the form. The technique we will use is often called “feature based” image alignment because in this technique a sparse set of features are detected in one image and matched with the features in the other image. A transformation is then calculated based on these matched features that warps one image on to the other. Previously, we had covered area based image alignment in ECC Image Alignment. If you have not read that post, I recommend you do it because it covers a very cool application involving the history of photography. What is Image Alignment or Image Registration? In many applications, we have two images of the same scene or the same document, but they are not aligned. In other words, if you pick a feature (say a corner) on one image, the coordinates of the same corner in the other image is very different. Image alignment (also known as image registration) is the technique of warping one image ( or sometimes both images ) so that the features in the two images line up perfectly. Figure 1. Left: A form downloaded from the Department of Motor Vehicles (DMV). 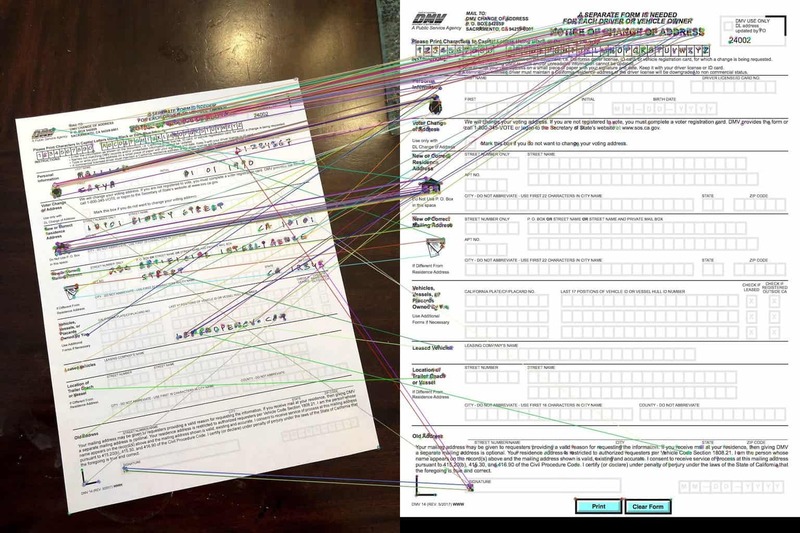 Center: The filled out DMV form photographed using a mobile phone. Right: The result of aligning the mobile photo (center) to the original template (left). In the above example, we have a form from the Department of Motor Vehicles on the left. The form was printed, filled out and then photographed using a mobile phone (center). 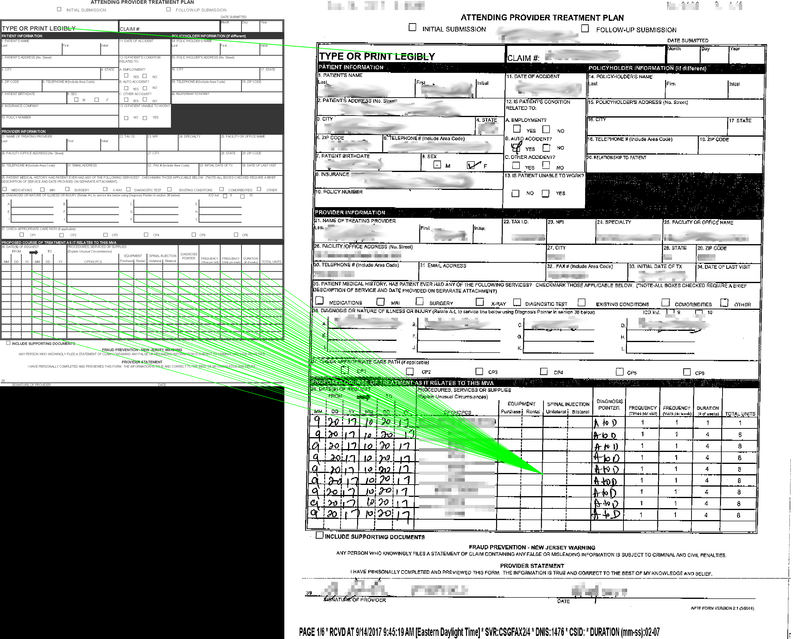 In this document analysis application, it makes sense to first align the mobile photo of the form with the original template before doing any analysis. The output after alignment is shown on the right image. Image alignment has numerous applications. In many document processing applications, the first step is to align the scanned or photographed document to a template. For example, if you want to write an automatic form reader, it is a good idea to first align the form to its template and then read the fields based on a fixed location in the template. In some medical applications, multiple scans of a tissue may be taken at slightly different times and the two images are registered using a combination of techniques described in this tutorial and the previous one. The most interesting application of image alignment is perhaps creating panoramas. In this case the two images are not that of a plane but that of a 3D scene. In general, 3D alignment requires depth information. However, when the two images are taken by rotating the camera about its optical axis (as in the case of panoramas), we can use the technique described in this tutorial to align two images of a panorama. At the heart of image alignment techniques is a simple 3×3 matrix called Homography. The Wikipedia entry for homography can look very scary. Worry you should not because it’s my job to simplify difficult mathematical concepts like homography! I have explained homography in great detail with examples in this post. What follows is a shortened version of the explanation. Two images of a scene are related by a homography under two conditions. The two images are that of a plane (e.g. sheet of paper, credit card etc.). The two images were acquired by rotating the camera about its optical axis. We take such images while generating panoramas. As mentioned earlier, a homography is nothing but a 3×3 matrix as shown below. If we knew the homography, we could apply it to all the pixels of one image to obtain a warped image that is aligned with the second image. If we know 4 or more corresponding points in the two images, we can use the OpenCV function findHomography to find the homography. An example of four corresponding points is shown in the Figure above. The red, green, yellow and orange points are corresponding points. Internally the function findHomography solves a linear system of equations to find the homography, but in this post we will not go over that math. where, points1 and points2 are vectors/arrays of corresponding points, and h is the homography matrix. How to find corresponding points automatically ? In many Computer Vision applications, we often need to identify interesting stable points in an image. These points are called keypoints or feature points. There are several keypoint detectors implemented in OpenCV ( e.g. SIFT, SURF, and ORB). In this tutorial, we will use the ORB feature detector because it was co-invented by my former labmate Vincent Rabaud. Just kidding! We will use ORB because SIFT and SURF are patented and if you want to use it in a real-world application, you need to pay a licensing fee. ORB is fast, accurate and license-free! ORB keypoints are shown in the image below using circles. Figure 3. Location of ORB keypoints shown using circles. ORB stands for Oriented FAST and Rotated BRIEF. Let’s see what FAST and BRIEF mean. Locator: This identifies points on the image that are stable under image transformations like translation (shift), scale (increase / decrease in size), and rotation. The locator finds the x, y coordinates of such points. The locator used by the ORB detector is called FAST. Descriptor: The locator in the above step only tells us where the interesting points are. The second part of the feature detector is the descriptor which encodes the appearance of the point so that we can tell one feature point from the other. The descriptor evaluated at a feature point is simply an array of numbers. Ideally, the same physical point in two images should have the same descriptor. ORB uses a modified version of the feature descriptor called BRISK. Note: In many applications in Computer Vision, we solve a recognition problem in two steps — a) Localization 2) Recognition. For example, for implementing a face recognition system, we first need a face detector that outputs the coordinate of a rectangle inside which a face is located. The detector does not know or care who the person is. Its only job is to locate a face. The second part of the system is a recognition algorithm. The original image is cropped to the detected face rectangle, and this cropped image is fed to the face recognition algorithm which ultimately recognizes the person. The locator of the feature detector acts like a face detector. It localizes interesting points but does not deal with the identity of the point. The descriptor describes the region around the point so it can be identified again in a different image. The homography that relates the two images can be calculated only if we know corresponding features in the two images. So a matching algorithm is used to find which features in one image match features in the other image. For this purpose, the descriptor of every feature in one image is compared to the descriptor of every feature in the second image to find good matches. 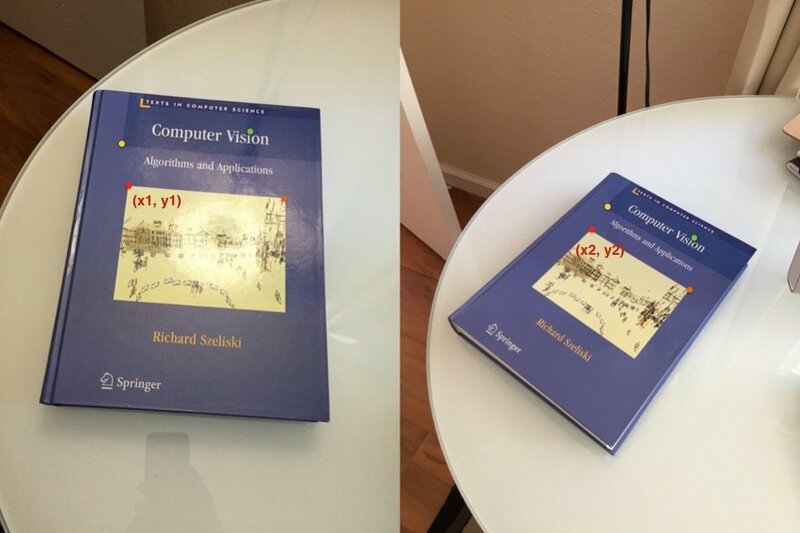 In this section, we present C++ and Python code for image alignment using OpenCV. The entire code is present in the next section, but if you prefer to obtain all images and code, download using the link below. Now we are in a position to summarize the steps involved in image alignment. The description below refers to the code in the next sections. Read Images : We first read the reference image (or the template image) and the image we want to align to this template in Lines 70-80 in C++ and Lines 56-65 in the Python code. Detect Features: We then detect ORB features in the two images. Although we need only 4 features to compute the homography, typically hundreds of features are detected in the two images. We control the number of features using the parameter MAX_FEATURES in the Python and C++ code. Lines 26-29 in the C++ code and Lines 16-19 in the Python code detect features and compute the descriptors using detectAndCompute. Match Features: In Lines 31-47 in C++ and in Lines 21-34 in Python we find the matching features in the two images, sort them by goodness of match and keep only a small percentage of original matches. We finally display the good matches on the images and write the file to disk for visual inspection. We use the hamming distance as a measure of similarity between two feature descriptors. The matched features are shown in the figure below by drawing a line connecting them. Notice, we have many incorrect matches and thefore we will need to use a robust method to calculate homography in the next step. Figure 4. Matching keypoints are shown by drawing a line between them. Click to enlarge image. The matches are not perfect and therefore we need a robust method for calculating the homography in the next step. Calculate Homography: A homography can be computed when we have 4 or more corresponding points in two images. Automatic feature matching explained in the previous section does not always produce 100% accurate matches. It is not uncommon for 20-30% of the matches to be incorrect. Fortunately, the findHomography method utilizes a robust estimation technique called Random Sample Consensus (RANSAC) which produces the right result even in the presence of large number of bad matches.Lines 50-60 in C++ and Lines 36-45 in Python accomplish this in code. // Detect ORB features and compute descriptors. // Registered image will be resotred in imReg. // The estimated homography will be stored in h.
// Write aligned image to disk. # Detect ORB features and compute descriptors. # Registered image will be resotred in imReg. # The estimated homography will be stored in h.
# Write aligned image to disk. The detector does not know nor care who the person is. Thanks. It is fixed now. For faces, you typically do not use homographies because a face is not a plane. For warping a face, we had used Delaunay triangulation followed by affine transform. Thanks for great and usefull post! I have one question. Is it possible to get parameters roll, pitch and yaw between original and warped object, from H matrix obtained by findHomography? Yes, you can decompose a homography into rotation matrix and translation vector. First of all, thanks for this clearly explained post. I was wondering, perhaps you could elaborate a little about the advantagesdisadvantges of the feature based approach you presented in this post, versus the ECC approach you discussed in a previous post? When will you use each? Yes, I should have done that. Here is a short explanation. ECC works very well when there is small misalignment. Because it uses large areas in the image, it is often more accurate. However, if there the mis-alignment is large, feature based image alignment should be performed first and the estimated homography can then be refined using ECC. There are other cases where feature based is the only option. For example, if we have a form that is largely filled up and therefore there is a big difference between the template and the filled up form, feature based is a better option. To summarize, ECC works when misalignment is small and the two images are close in appearance ( e.g. medical video frames ). When misalignment is large, and there are large differences in appearance, we should use feature based. To be more clear on the ‘close in appearance’ difference between dense (e.g. dense Lucas-Kanade, ECC) and sparse (feature-based) alignment: dense algorithms make the “brightness constancy” assumption, i.e., the assumption is that the two pieces of the image that you’re aligning have the exact same colors/exposure. Of course this is never the case with two real images, although most of the time it’s close enough. Feature-based methods however are much more robust to this. They can work without specific local pixel information. Thank you for your great work, specially this blog and the CV4Faces course. Consider the case in which it’s very likely that both imagens have similar perspectives. Is there a way to use a prior probability distribution in findHomography or, maybe, limit the parameter ranges? I have already seen cases in which the two images were captured with very similar perspective, but findHomography gave an unexpected transform matrix, assuming a big change in perspective. Probably it might be avoided by improving the feature detection/description. Even so, I feel it would be good to make findHomography’s job easier by restricting parameter ranges or increasing the chances for expected transforms. Hi Thanks for the post. Great article – this is just what I’m after, since misalignment will be large in my application. How would you go about extending this to detect one of many possible objects (all planar)? I want to automatically select the correct reference image. Should I test each and every reference image and use the one that has the most/best matching features? which runs faster c++ or Python ?? Warping does not produce noticeable artifacts. So, it should be good. Is there any potential tuning that I might use to resolve this issue? Any help or direction of further inquiry would be greatly appreciated. Have you tried increasing the number of matches. Hi Satya. Thank you for your great article! I have a question. After alignment, by eyes I can tell whether it is good alignment or not. How can I do it in automatic way? Thanks for the awesome articles. By reading both the ECC and this post I wanted to ask about the difference between ECC and this approach. What could be the most proper situations to use each of these approaches? EDIT: Nevermind! I just found my answer in one of your comments. Thanks for updating the comment. which of orb/sift/surf are robust and best for image aligning ? I think the performance is about the same. SIFT is slowest of them. More importantly SURF and SIFT are patented and therefore cannot be used in a commercial application. how to calculate score matching of an Image to get best fitting to specific image-template member of the list ? I have a set of 12 images with the camera traversing an object. How can align (stabilization) the images? I want to create an animated GIF of this images. Thank you very much for the code. I’m just not sure what to do with it since I’m not trying to realign the image but instead correlate any coordinate on the “object” with the corresponding coordinate in the “image”. I’ve been trying to accomplish this task in my program and apparently I need holography to do it. Holography is new to me and the jargon has my head spinning. Basically, I am projecting a video to a screen (at this point it is a video of a Chess Board) and capturing a streaming feed of that screen with a USB camera. So at this point the object is the projected image of a chessboard and the image is the camera capture of that projection screen. It is the camera stream that my program will be working with. So the projection screen is the “object” and the camera frames are the “images”. I have done a findChessboard() on both the camera image and the projected object and then did a findHomography() using those two vectors. So now I have my image, my object, the corresponding vectors with the Point2f points and the Mat holography. If I get a input x,y coordinate on the object how do I use that holography to get the corresponding x,y coordinate on the image? I just can’t figure out how to use that holography for what I need to do. Any help, of course, would be VERY much appreciated.